An IDF force, including tanks, a bulldozer and a number of vehicles was blocked on Thursday by French UNIFIL troops at the outskirts of the south Lebanese village of Marwahin, near the border with Israel. According to reports, the IDF force asked to advance deeper into Lebanese territory, but was stopped about 500 meters from the road leading to the village by four UNIFIL tanks manned by French soldiers as two Israeli Merkava tanks operated nearby on Lebanese soil, setting up checkpoints. AFP reported that Israeli soldiers confiscated the identity cards of photographers at the scene, claiming they may give pictures of the Israeli military to Hizbullah members. IDF sources said they are looking into the incident. More than 90 percent of the territory previously controlled by the IDF in south Lebanon has been transferred to UNIFIL, but a few hundred soldiers still remain in the area. Earlier in the week IDF and UNIFIL representatives discussed the issue of the village of Rajar, which is partly controlled by Israel and partly on the Lebanese side; the parties have yet to agree on ways to transfer information between UNIFIL and the IDF and on regulations for opening fire. More than 15,000 UN and Lebanese troops are currently deployed in the southern region, with thousands more expected to arrive in the coming days. Contrary to previous estimations, the negotiations for the withdrawal of the last IDF soldiers from Lebanon have not been completed. "We are postponing the transfer of territories until an agreement is reached," Halutz said recently. "We cannot end this within a day or two." The army chief made it clear that the IDF had issued a warning to the Lebanese army that any use of military equipment in the area, including intelligence means, would constitute a violation of the ceasefire resolution. "We conveyed a message that we will operate against any conduct suspected to be a terrorist activity," he said. 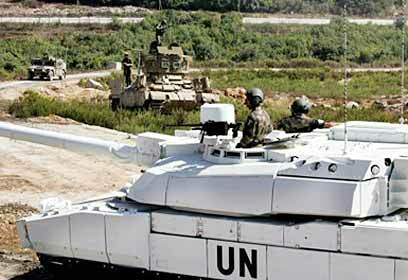 See all talkbacks "Lebanon: UNIFIL tanks block IDF force "